There are many species of sharks found in the oceans around the world. Some of them are very big while others are quite small. Some of them are to be feared while others mind their own business and they are very calm. You may be surprised to learn some of the largest species of sharks in the ocean are the nicest ones to encounter. This information will help you identify some of the common species of sharks. 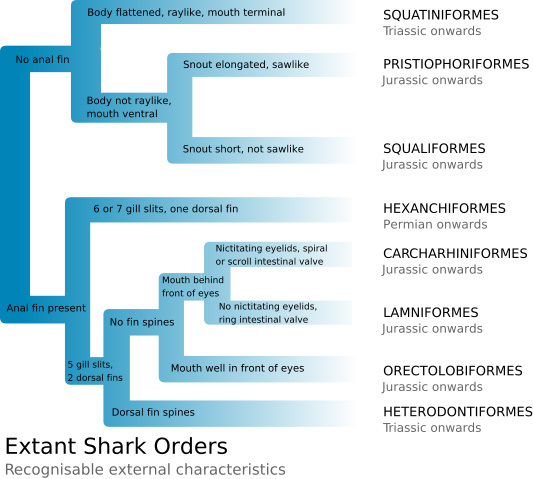 There are 440 different species of sharks in the world today classified into eight different orders described below with some examples of known sharks species for each group. One of the most unusual types of sharks our there are know as angel sharks. Many people mistake them for some other types of sea creature. It isn’t uncommon for them to be thought of as large stingrays. But the simplest way to tell them apart is by looking at the location of the fins. On the angel shark, they won’t be on the head. This type of shark isn’t a meat eater. Instead it focuses on what it can find along the bottom of the ocean. Clams and mollusks often are a big part of their overall diet. The coloring of angel sharks allow them to blend in well with the bottom of the ocean though so they often go undetected. Another unique type of shark is the Hammerhead Shark. It has a long head that looks like they ends of a hammer on both sides of it. Many people are afraid of it due to the way that it looks. Yet it is very unlikely that they will attack a person. Nine hammerhead species are generally recognized but only three types can be dangerous to humans. Reef sharks seem to be able to adapt to life just about anywhere including captivity. 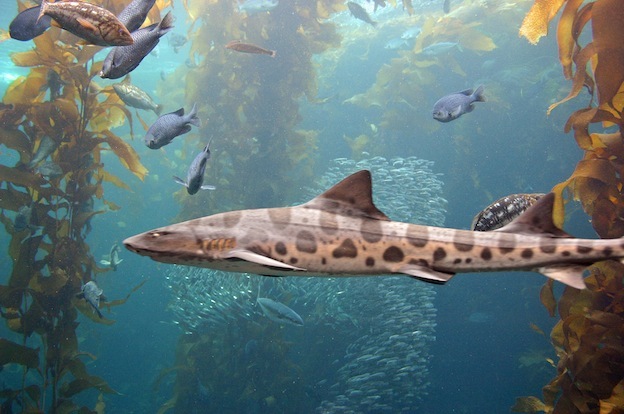 They are loners and very seldom interact with other sharks unless it is time for breeding. Reef Sharks can grow up to six feet long and they have very distinct features. They are gray in color on the top. Underneath they are all white or they have streaks of white. The tips of their fins are black. All sharks swim very fast, but the blue shark is one of the fastest species. Blue Sharks often look hungry due to the thin body they have. However, they are slender by nature and it has nothing to do with the amount of food they eat. Due to the roundness of most other types of sharks though they do seem quite on the thin side. They aren’t picky at all about what they will eat though so they never go hungry. The blue shark is considered to be one of the most dangerous sharks in the waters. It has been known to attack people, which makes it one of species of shark that people most fear. Probably the best known species of shark is the great white. This is believed to be the most dangerous type of shark in the world. People have been able to see them as they are among the rare species that do raise their heads out of the water. Great white sharks can grow up to 16 feet and weight around 1,500-2,400 pounds. Some have been known to weigh around 4,000 pounds but that isn’t the norm. More people have been attacked by great white sharks than any other shark species. Locations where they are living have been identified and people are encouraged to stay away from them. Even so, swimmers, surfers, and divers have had numerous encounters with them. Read the Great White Shark Fact Sheet. While all sharks have similarities including they way their bodies are formed they also have many differences. Now that you are aware of some of the different types of sharks out there you can look into those that capture your attention in more detail. Sharks are very interesting and you will find there is an abundance of information out there to explore.